Go all-in on an industrial motif with this rustic rectangular wall mirror. Rustic and industrial, this rectangular wall mirror from Uttermost makes a stunning statement in any living room. Constructed of fir wood, iron, and MDF, the beveled glass marries with a natural weathered texture finish that features burnished silver iron accents to radiate warm elegance. Install vertically or horizontally using the welded swing D-rings hanger and adjustable J-hooks. 25 1/4" wide x 37 1/4" high x 2 1/2" deep. Hang weight is 15 lbs. Glass only section is 16" wide x 28" high. Beveled edge is 1 1/4" wide. 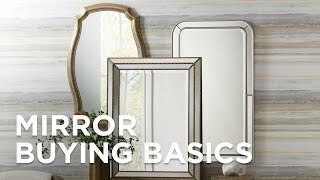 Rectangular wall mirror from Uttermost Siringo Mirror collection. Can be installed vertically or horizontally. Welded swing D-rings hanger with adjustable J-hooks. Natural weathered texture finish with burnished silver iron accents. Reclaimed fir wood, iron, and MDF construction. Beveled glass. Absolutely love this mirror .Excellent quality and great appearance ! A sophisticated mirror from Uttermost presented with a hand-rubbed blue green finish.